An astonishing 8.9 million journeys are made on public transport each day in Singapore, and this is only possible through efficient and effective planning, designing, building and maintaining of Singapore’s land transport infrastructure and systems. The Land Transport Authority’s (LTA) vision of creating a ‘people-centred land transport system’ zips us to the future with exciting land transport options. By leveraging on technology to boost rail and bus infrastructure, it aims to bring about a greener and more inclusive public transport system. 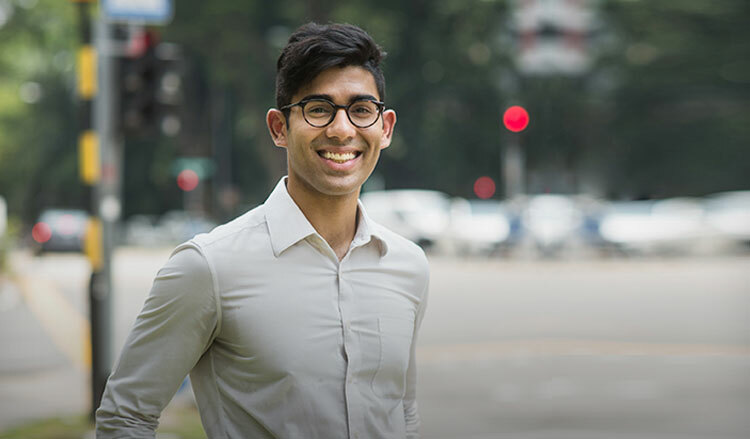 Mash Devaser, who is an engineer in the Traffic & Road Operations (TRO), shares how his role helps to turn LTA’s vision into reality, and how his scholarship experience is preparing him to be an industry leader of tomorrow. What motivated you to apply for the LTA Overseas Undergraduate Scholarship? Mash: I believe it was a combination of my inquisitive nature, passion to experiment - especially with reverse engineering - and attention to details which cumulatively directed me towards a career in engineering. As a frequent commuter of public transportation in Singapore, I valued the need for a dynamic and progressive system, and was and am always excited to see the new developments from LTA. With an inclination towards engineering and local land transport developments, the scholarship with LTA offered the perfect opportunity to marry both of my interests. How has your overseas undergraduate experience benefitted you personally and professionally? Mash: My overseas undergraduate experience at Bristol University offered a window into the standards and norms of public transportation in the UK and Europe. While I was abroad, I endeavoured to maximise every travel opportunity, which provided wider exposure and deeper appreciation of how much coordination, effort, and data collection is necessary for effective execution of land transport plans in a professional context. Share with us the other opportunities you had received as an LTA scholar. Mash: Having only just begun my career with LTA, I have been really blessed with opportunities to present areas of my division’s work (Intelligent Transport Systems Operation or ITSO) to ministerial levels - once to a panel of Ministry of Transport financial officers, and another to a Senior Minister of State. I have also had the privilege to sit in for meetings with senior management, giving me a broader perspective of the moving parts in our land transport development plans. In addition, scheduled job rotations allow breadth of work and exposure to other elements of LTA, such as the ‘Walk Cycle Ride Singapore’ initiative, and larger and longer-term projects like the North-South Corridor (NSC) and the Thomson-East Coast Line (TEL). What are some exciting new or upcoming projects that you are working on? Mash: I am part of the team in the TRO Group supporting the development of a new generation of traffic lights, a long-term project which adds an element of anticipation and excitement to my daily work. Another interesting aspect of my work includes exploring the use of drone technology to assist in traffic optimisation operations. What are your career aspirations and how does LTA help you to achieve that? Mash: LTA has offered me a good foundation to accrue ground knowledge, essential to the development of any engineer before taking on more senior positions. Supplemented by my eagerness to plan and continuously learn, LTA continues to provide diverse opportunities for my holistic development, both personally and professionally. National Environment & Water (NEW) scholars shares their rewarding journey in the public sector.